For the sake of their health, Indians would do well to leave their cars, scooters and motorbikes behind and walk or bicycle instead, according to research just published in the journal PLOS Medicine. That also means that more investments ought to go into making such physical activity safe and convenient. In India, economic prosperity has led to a boom in motor vehicles, which has gone hand in hand with less physical activity and greater consumption of energy-dense food. The number of people who are overweight and obese is projected to increase rapidly in the next two decades. This country already has more individuals with diabetes than any other nation and their number is set to expand. Deaths from heart disease are also expected to shoot up. ‘Active travel’ — walking, cycling or use of public transport — is one of the measures that the World Health Organisation recommends to address the growing burden of non-communicable diseases. To examine the health benefits from such active travel in the Indian context, researchers from Imperial College, London in the U.K. and the Public Health Foundation of India scrutinised close to 4,000 participants in the Indian Migration Study. About 2,500 of those surveyed were urban dwellers while the others lived in rural areas. 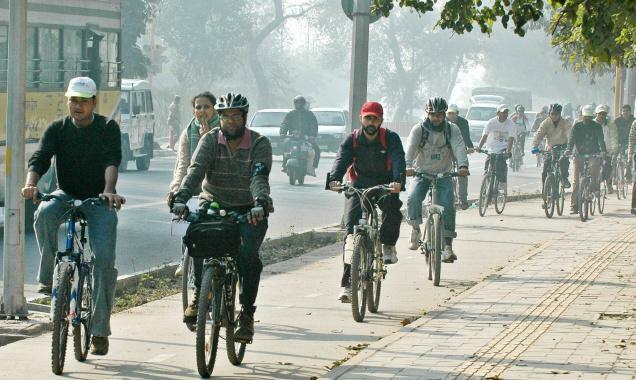 More than 60 per cent of the villagers travelled to work on bicycles while private vehicles were the commonest mode of transport among their urban counterparts. The study found that those who walked or bicycled to work were less likely to be overweight than those who relied on private vehicles. Those using bicycles also had a lower likelihood of diabetes or high blood pressure. “People need to take physical activity seriously,” remarked Sutapa Agrawal of the Public Health Foundation of India. The study had also shown that migrants from villages quickly adopted an urban lifestyle and had associated health problems. is that smog in the backround? i would think they would concentrate on getting the cars and the utility companies to put scrubbers and catalytic converters and such on their auto to cut down on that pollution, that can’t be healthyto breath in while exercising.